Sync and charge multiple devices with ease using 4XEM's USB 2.0 To 8-Pin Lightning and Micro USB Cable. 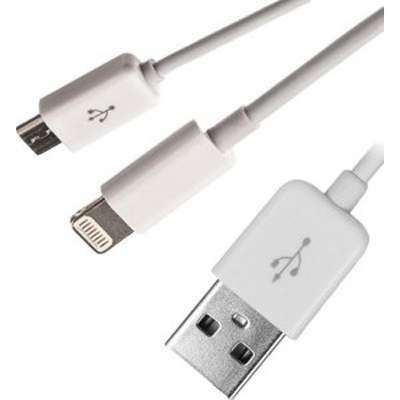 One USB 2.0 combo cable gives you two choices of connectors-sync and charge your 8-Pin Lightning enabled iDevices or your Micro USB enabled Samsung, HTC, Blackberry or camera devices to your computer's USB port. Featuring a durable and compact build and ultra-fast transfer rates. Problem it solves: Multitask with one cable to charge and sync all your devices over USB 2.0. Whether you need 8-Pin Lightning or Micro USB, this cable offers both.